To start, there was a fair amount of body repair work that had previously been repaired fairly poorly, which is understandable for a race car, but 9M wanted to set about correcting it back to the original factory standard that it had when new. Looking at their quality rear quarter panel replacement work, there’s now nothing to indicate that it had ever been banged up before. The original idea of the project was to keep as much patina as possible, including it’s worn through paint next to the clutch pedal, but that was quickly overruled once the process was underway. We are normally all for patina too, but it’s not as if Juan Manuel Fangio drove the car like in our previous feature, so we would have done exactly the same thing too. For paint, they went with Lechler MAC4 high solids top coat, which was chosen for it’s ability to replicate the factory’s original finish. The whole painting process was done in one non-stop 4 hour session, which is a lengthy but necessary procedure if you want the end result to be correct. We have always been huge fans of 964 narrow bodies fitted on 18″ 3-piece Speedlines (in photo directly above, again) or the factory 17×8 and 9.5 Cup rims that this car wears. Both designs are replicated by several aftermarket companies that most project builds resort to because of the price difference, so we are glad to see this one sitting on the correct factory rims. In any case, since this was not a full nut and bolt restoration, all of it’s parts were then re-installed onto it’s freshly painted body and then the car was taken out to a track day at Oulton Park. Unfortunately, a small glitch held the Cup car back from lapping but it was nothing that should be too difficult for the crew to repair for a return to the track again soon after. In the end, 9M was never able to substantiate any paperwork to verify that this was the actual championship winning race car, but we would have to tend to believe that this Viper Green Cup car is the actual original “Kermit”. Got a new load of parts in, which includes TONS of used and NOS items from a large range of years. Let us know what you’re looking for! Thanks to our friends from Twin City Plumbing for their help with their service trucks. When it comes to the maintenance on your Porsche are you a Do It Yourself (DIY) type of owner? If so, and maybe even if you’re not, then this post is for you. As a kid, I used to relish taking the time to fix a problem on my then current ride of choice. My family didn’t have a lot of money growing up, so my cars were usually whatever I could purchase with the money scraped together from a couple of part-time jobs. The fact that the car I was buying may not be running at the time of purchase never really deterred me (just ask my friends) as I knew with the right parts and perseverance I could get it running. Part of this process usually involved a trip through the labyrinth of junked and abandoned car shells littered across the grounds of the local junkyard. With a box full of wrenches and the resolve to spend the time to find whatever I might need I knew I would/could get the car running again. Well, let me tell you, times have changed, and drastically. No more searching and hunting for a car with the right part. No more getting lost in the maze of dusty cars and trucks wondering if the dog you hear barking is that proverbial “junk-yard” dog or just a neighborhood stray. Read on and you’ll understand. Sara Darkamen is the VP and Co-owner of Los Angeles Dismantler. Sara and I first met through Linkedin and the Porsche network there. Ever since then, we have corresponded through email and a number of various social networking sites including facebook and Rennlist. What I’ve come to know about Sara is that she is passionate about networking and even more passionate about Porsche; two of my favorite things. As a result, I asked her to write up a brief overview of her company so that for those of you who are the DIY type, and need quality parts, have another venue (if you weren’t already aware of them). Walking into the store for Porsche arouses mixed feelings. On one hand, there is a bit of sadness in seeing so many wrecked Porsches. On the other hand, wheels immediately start turning in the head. What would it take to swap a 996 Turbo engine into something a little older, or a little lighter? It doesn’t stop there though. The interchangeability of parts through various generations of Porsches leaves the possibilities nearly endless. Brakes, transmissions, interior pieces, even front end conversions are possible with a bit of ingenuity and work. The sight of 100’s of Porsches in conditions ranging from completely destroyed, to nearly perfect is impressive to say the least. Every car has a story, and for most of them, it comes to an end at this lot. When a car comes in, it is photographed and documented. Usually two or three guys stand around and try to piece back together the cars last moments. Some cars fates appear obvious, others remain total mysteries. Either way, questions of how and why are rarely answered. 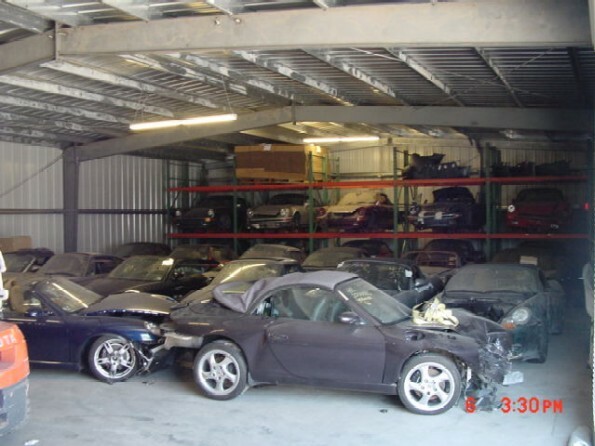 Most cars come in with salvage titles, so even if the car could be brought back to life, it simply wouldn’t be worth it. The few cars that arrive in running, drivable condition rarely last long that way. The unfortunate reality is that almost all the cars that come in, are worth more in pieces. New Porsche parts can be extremely expensive, and some parts are nearly impossible to find for older models. 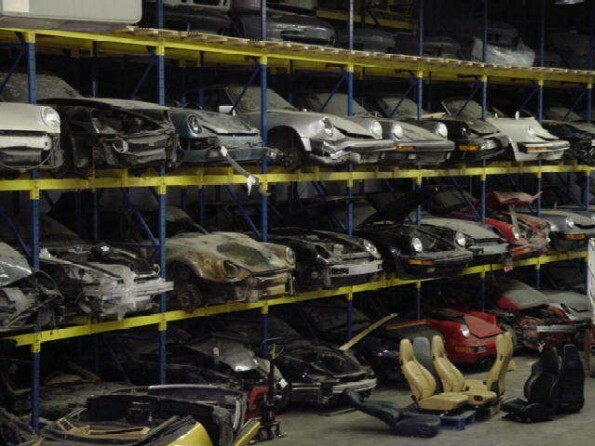 The demand for used parts grows with every mile Porsches are driven. No matter how destroyed a car is, there are still valuable parts that can be salvaged. These parts are bought up by various mechanics, body shops, and enthusiasts. 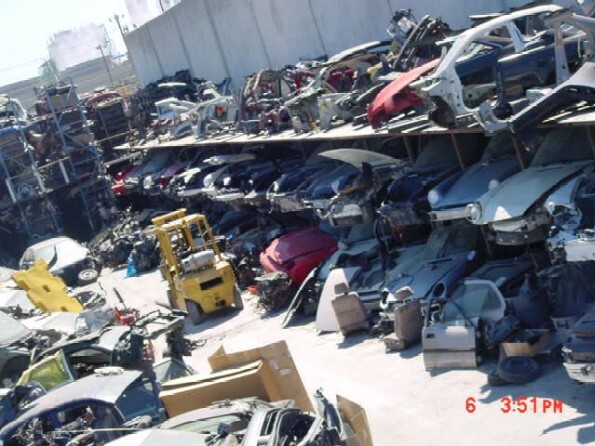 Little of the car is wasted, components that can be resold are shelved or shipped, and any scrap metal is recycled. The average Porsche owner is not one to neglect their car. Fortunately, this is reflected in the parts that come off the cars.